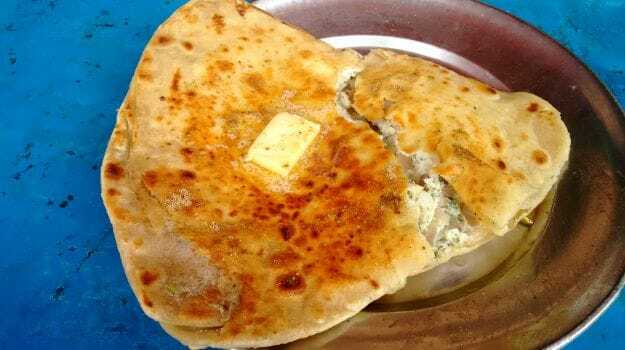 While bread and eggs may hold the pride of place when it comes to comfort food, many Indians, if given a chance, would happily trade the slice of bread for their beloved paratha. Crisp, flaky, and often stuffed with spice-mixed fillings of potatoes, vegetables and even meat, it is a fitting dish and quite decadent, might I add, especially when doused with generous helpings of desi ghee. Yet, it is perfect for breakfast, with the capability of effortlessly curbing your hunger until lunchtime when you take a break from work. Among the various fillings, the most popular choice is, without any doubt, the Aloo Paratha. The crisp outer and the gooey inner work miraculously to make it an irresistible treat. But if you were to ask me, my all-time favourite is the Egg Paratha. I discovered my love for it during my short visits to the capital to meet family and friends, when I would make it a point to venture out early mornings to roadside stalls for a bite of Delhi’s famousparathas. The Egg Paratha caught my fancy because I was intrigued how an egg could be sealed so neatly within a paratha while cooking it on the tawa. If you inspect the paratha after it’s cooked, you wouldn’t be able to find any trace of egg on the outer surface. Only when you tear into the paratha, does it reveal itself. Much later, I learned the trick of getting it right. The best places to savour Egg Parathas are roadside stalls. They make it without any frills but diligently to serve you flavours at their best. And all for an amount of 20-30 rupees. These are also the best places to learn tricks of perfecting the recipe. The process to making Egg Paratha is actually quite simple. Starting with the dough, you can use the same one you make at home for rotis or other parathas. Most commercial places use a mix of refined and whole wheat flour to make the paratha, but you can use whole wheat flour or multi-grain flour too. So make the dough like you normally do, and while rolling it, try to double fold and shape the dough into a triangle. Point to note: the folds are important as they play an important role later. For the egg mixture inside, you can follow the same recipe for making Masala Omelette. In a bowl, whisk the eggs well along with chopped onions, green chillies, coriander leaves, a pinch of salt, and half a teaspoon each of red chilli powder and garam masala if you like. The skill of the recipe only comes into play when you start cooking the paratha on thetawa. Midway through the process, when the paratha is starting to crisp on the outer, you need to make a small slit using a sharp knife along the folds on one side of the triangle. Quickly pour in half the quantity of egg and let it slide in, then flip it over and repeat the process. Drizzle some oil (and generous amount if you want your paratha to be nice and crisp) over the paratha and using the back of a spoon, gently press on the surface. As the egg mixture begins to cook inside and the oil crisps up the outer surface, the paratha will fluff up and the edges will seal itself, leaving no trace of the deed done. Enjoy the paratha hot with a little serving of pickle on the side, or like some of my friends, with a squeeze of tomato ketchup. For the gluttons, you can’t miss out on the generous serving of desi ghee on top! 1. In a mixing bowl, add flour, salt and oil, and knead the mixture into a smooth dough using 1 cup of water. You can add in a little more water if the dough seems dry. Knead well. 2. Divide the dough into 4 balls. 3. Roll out the dough ball evenly using a rolling pin, then fold it twice to form a triangle. Roll it out again to make a triangular sheet. Repeat the process with the remaining dough. 4. In a bowl, whisk the eggs well along with onions, chilli, coriander leaves, garam masalaand salt. Keep aside. 5. Place the rolled dough on a hot tawa, and let it cook for 1-2 minutes on both sides. Add a little oil on the surface and let it cook for one more minute. 5. As the edges start to crisp, quickly make a slit using a sharp knife along the folds and pour in half the quantity of egg. Tilt the paratha a little so that the egg mix slides in. Then flip it over and repeat the process on the other side. 6. Drizzle some more oil on the paratha and press the surface gently using the back of your spoon. Turn up the heat and continue cooking the paratha until it fluffs up and turns crisp brown. 7. Serve hot with a helping of desi ghee on top.